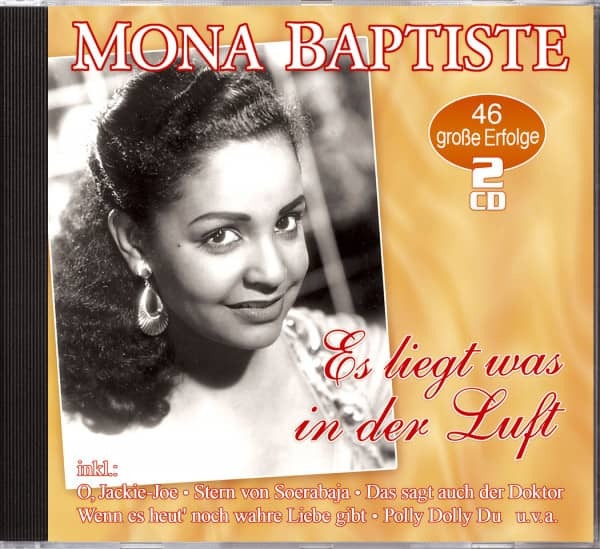 Mona Baptiste was born on 21.06.1928 in Trinidad. In 1948 she left her home to live in London to start her career as a singer. In London she sang with Cab Kaye and Stéphane Grappelli, later in Paris with Yves Montand. In 1953 she came to Germany, where she got her first record contract. With the orchestra Werner Müller recorded her first record "Wer mich küßt, ist gefangen". Mona Baptiste could also be seen in the cinema, among others in the films "An jedem Finger zehn", "Das Fräulein "How do I become a movie star?" In 1954, in a duet with Bully Buhlan, she achieved her greatest success with the title "Es liegt was in der Air" (1954, 2nd place). 1954 and 1955 were their most successful years with further hits like "Polly Dolly Du" (1955, 9th place), "Halt! Stop! (Hold on to your husband)" (1955, 21st place) and "O, Jackie-Joe" (1955, 6th place). Besides her German records, Mona Baptiste also recorded titles in English. In 1958 she changed the record company and appeared in numerous television shows. After her husband's accidental death, she retired from show business. In the 70s she tried to make a comeback, but could not continue her old successes. 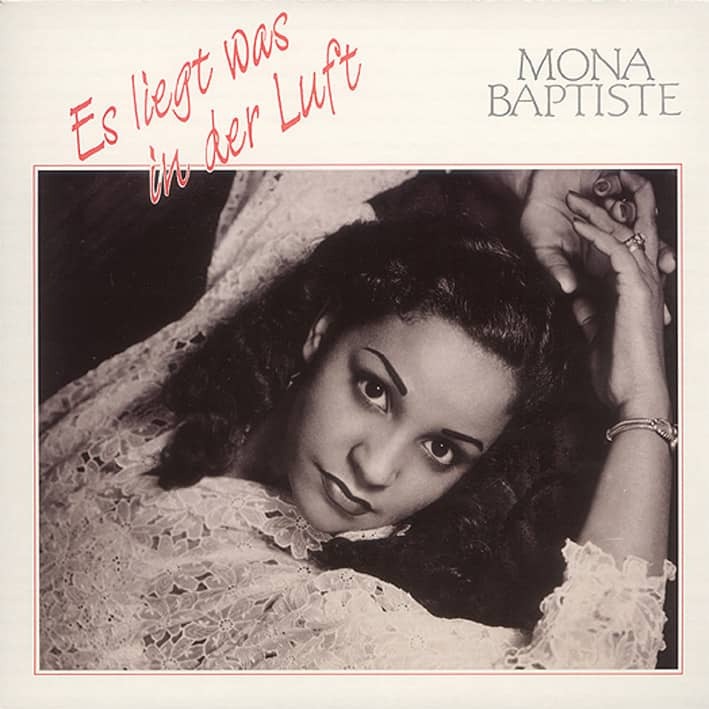 Mona Baptiste died in Krefeld on 25.06.1993. Her unmistakable voice remains unforgotten. 04 Wo ist der Eine? Whoever kisses me is trapped in a record production from 1954, performed by the coffee-brown-skinned hit beauty Mona Baptiste from Trinidad, who a year earlier had received a record deal in Germany and soon represented the Schlager-Wohlklang, which was in tune with German schmaltz, on stage as in the film. Listen again in Boy, come and kiss me and the girl from the mambo bar. Born in 1928, Mona began her career at home in Trinidad, then went to London, where she sang with the jazz orchestra Ted Heath. Her performances with Stéphane Grapelli and Yves Montand in France also attracted a great deal of attention. She died in Krefeld in 1993 at the age of 65. The young lady, who claimed in 1967 to be a single girl and in a second title (And I shall forgive you for all this) at least let us see that she was already familiar with the downsides of everyday relationships, was not nearly as naïve as her lyricists put it in her beautiful mouth, but had already had ten successful years in the film business behind him by this time. And a picture-book career started, which the Viennese Senta Berger, born in 1941, let be at home in the big feature film studios, including Hollywood - the long list of her partners with whom she was on camera in the fifties and sixties, includes Yul Brunner, Deborah Kerr, Lex Barker, Rita Hayworth, Grace Kelly, Kirk Douglas, Marcello Mastroianni, Max von Sydow and Alec Guinness to Heinz Rühmann, Bernhard Wicki, Christopher Lee, Alain Delon and Jeanne Moreau. Even after almost fifty years of work, she is not only on the road as a grandmother, but enriches German television with serial characters from criminals to taxi drivers. Always enchantingly smiling, always neat, always sparkling clean as if peeled out of an egg. 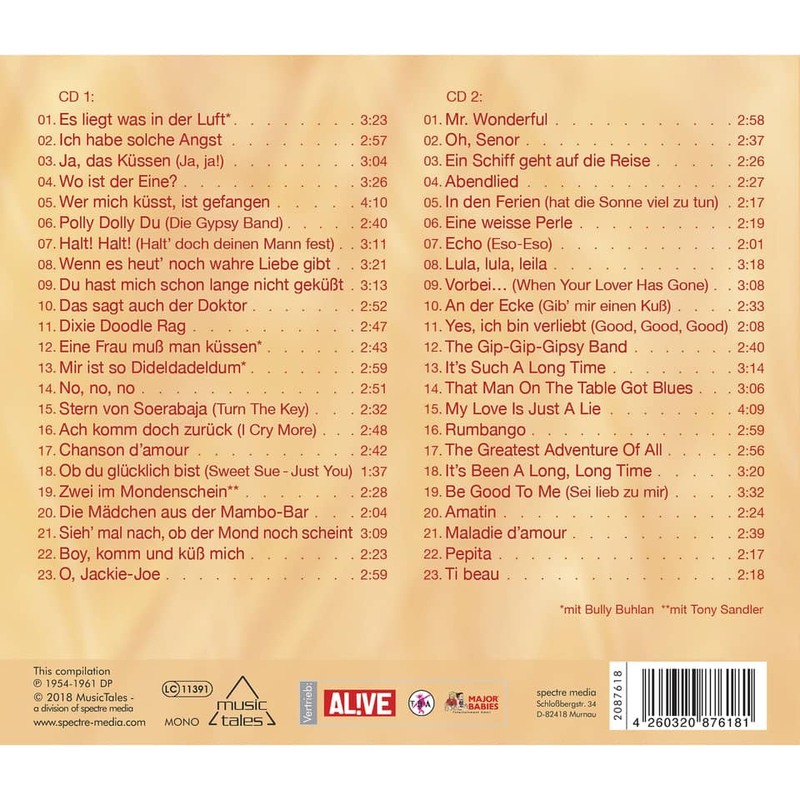 Customer evaluation for "Es liegt was in der Luft - 46 große Erfolge (2-CD)"